To equip Christian scholars, theologians, and educators at the highest level by providing a Ph.D. programme in Christian Studies. To equip leaders and educators who engage Asian societies and Church in Jesus Christ’s mission of transformation. 1. Prof. Atul Aghamkar Professor and Head, Department of Missiology, SAIACS, Bangalore,India. 5. Prof. Brian Wintle Former Professor, Department of Biblical Studies UBS & Former Principal, Union Biblical Seminary, Pune, India. 7. 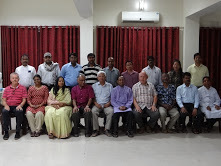 Prof. Daniel Jeyaraj, Professor of World Christianity & Director of Andrew F. Walls Centre for the Study of African and Asian Christianity, Liverpool Hope University, U.K.
8. Prof. Rajkumar Boaz Johnson, Professor of Old Testament & Director, Division of Christian Life and Thought, North Park University, Chicago. 9. Prof. Robert K. Johnston, Professor of Theology and Culture, Fuller Theological Seminary, Pasadena, CA. 10. Bishop Dhirendra Kumar Sahu, Former Professor of Theology at Serampore College, India & Director of CATS, SHUATS. 12. Prof. Evangeline Anderson-Rajkumar, Professor & Dean of Doctoral Studies, UTC, Bangalore, India.